As we enter into the fourth year of this term, we are pleased to report that we have kept faith in your overwhelming mandate as we continue to build a society that has greater opportunities for all. Tonight, I can report that the economy continues to grow; more people are being employed, and there is the general feeling that the economic storm of the recession years is over. We acknowledge there is still a lot of work to be done — to provide employment and even housing for many, to lift them out of poverty; but we are encouraged that hope reigns even among the people who have yet to feel the full positive effect of this rising tide. Based on first quarter performance for 2016, the Grenadian economy is expected to achieve at least the 3% real growth targeted for this year, after having grown more than 5% in 2015. During the first quarter of this year, current revenue increased by over 10%, when compared to the same period last year. At the same time, we were able to reduce expenditure by almost 9%. There are strong, positive indicators in many sectors of the economy. In the tourism sector, first quarter stayover arrivals exceeded the comparable period in 2015 by 12.3%. This growth was led by a 32% increase in arrivals from the leading US market. Arrivals from the other Caribbean countries increased by 26%, while the UK market recorded a 5.1% increase. Cruise ship arrivals increased by nearly 35%. The construction sector is projected to continue its positive growth in 2016 with ongoing private sector developments being complemented by the implementation of public sector investments, including the construction of the Parliament building, several activities under the Disaster Vulnerability Reduction Project, and several road development works. The value of first quarter imports of construction materials increased by 18%; while retail sales of building materials increased by 14%. In the area of Agriculture, there was a near 13% increase in the value and volume of nutmegs, and a 36% increase in the volume of mace production. The overall rate of job creation is expected to improve, driven mainly by developments in the construction service and tourism sectors. Brothers and sisters, tonight, I also want to specifically discuss the issue of reform and transformation. For as much progress as we have made, our growth potential is being constrained by resistance in some circles to any push for reform, which is needed for complete transformation to take place. Together, we must overcome this cultural fear of change. This new world order of different challenges calls for a radical attitudinal shift to be able to fulfil our potential, and to continue to build a society for which the next generation could be justly proud. It is that reality that has influenced the nation’s push for constitutional reform, which will set a more relevant legal framework for the advancement of our people, the enhancement of our dignity and the future of our children. As a broad policy position, this government continues to back the ongoing constitutional reform process — a process that has been thorough, robust, transparent and independent. The final bills are now before parliament, and it is still our hope that our people will be able to vote on the independent committee’s various recommendations this year. The process has been led and promoted by an independent committee, representing all sectors of the society, which include the business sector, churches, trade unions, other political parties and NGOs. The government has been pleased to be just a small part of this historic process. We are pleased that this is a genuine patriotic endeavour, and as far as my administration is concerned, we will leave it up to all patriotic Grenadians to vote their conscience on the matters that will be put forward for the future of our Nation. Our role is to offer the leadership that is required. We have enough faith that this generation will see the vision, and make the decisions necessary to progressively act on it. We refuse to accept the notion of the current opposition that no good idea should be acted upon because it comes from opponents — or from people they wish to demonize. It is a position we noted that they also adopted during the recent energy sector reform exercise by refusing to support the move to embark on a path that would ultimately lead to cheaper electricity costs for citizens. Once again — unfortunately — they have come down on the wrong side of history. For when this sector is finally restructured; and when Grenada improves its energy security by its investment in renewables, the records will forever show those who backed reform and transformation; and those who did not. And history will judge all of us accordingly. We must be of that chosen generation of which the Bible speaks about in Isaiah — a people who once walked in darkness but now have seen a great light. In this matter, as in others — we cannot allow past missteps to be an excuse for current inaction. To do so, is to replace hope with dread; to trade the future for a depreciating past. The other issue about reform is the need to modernize the public sector, so that it can deliver efficient, cost-effective, and sensitive service to all our citizens, particularly those who need it most. This is not an issue for any one political organization to solve. It must transcend politics; and it must not be held hostage by conspiratorial theories, sectoral egos or personal agendas. Indeed, public sector reform must become a moral issue of this time — which civil society must join in promoting. It is a form of corruption if we continue not to give the people value for their taxpayers’ money. Permit me also to address a recent matter that should trouble us all because for us, it speaks to the issue of understanding, fairness, looking out for each other and basic human compassion. Those who have advocated industrial disruption over this government’s genuine desire to employ over 80 trained nurses, who since before we came into office, have been pleading for employment, must ask themselves: are we fair to the struggling families of these nurses; or to our friends and neighbours crying out for better healthcare? We have been advised that there is no industrial action relative to this issue. Whatever objections are purely legal, and those will be dealt with through the appropriate processes, which all sides must recognise. In the interim, as leader of this Nation, I want to personally appeal to our sense of fairness, and this innate cultural trait we inherited — that we are all one family. In fact, Government reiterates its commitment to the agreement of the Social Partners, that in moments of possible dispute or controversy, members will firstly revert to discussions and a stable approach to problem-solving, before making the issues public or taking other actions. Our people who have grown up in a culture that fear their God and respect their neighbours will all agree that this is the way to go to maintain peaceful and harmonic relations. The batons we will pass on will be laced with more goodness and fairness, than the ones we were handed. In that vein, we acknowledge that government must do its part to improve working relations with the public sector. The two most significant issues that need to be resolved to improve the working relationship are increments and pensions. As we approach settlement of these two issues, the Government looks forward to continuing to work closely and collaboratively with workers’ representatives. We shall be guided by two main principles. The first is fairness to public officers. We must ensure that their legal rights and legitimate expectations are met. The second is the Government’s obligation to ensure that the needs of all sectors of the population, especially the vulnerable, are also met within the context of the economic constraints faced. With regard to increments, the Government continues to recognise and affirm that outstanding increments are an obligation which Government will honour. The Ministry of Finance has completed the calculations for the outstanding period as well as for the current period, including 2017. 2016 and 2017 increments will be paid as due. With regard to the arrears, 2014 and 2015, Cabinet has directed the Ministry of Finance to engage in discussions with the representative unions to decide on a payment plan that will see the liquidation of this debt at an agreed upon schedule. My Sisters and Brothers, with regard to pensions: Government is fully committed to ensuring a just and equitable pension arrangement that would allow retired Public Officers the ability to have dignity and a high quality of life in post-retirement. Government commissioned a study of the issue by the Caribbean Regional Technical Assistance Centre (CARTAC). We have received a draft report and are in the process of reviewing the initial recommendations to ensure that they provide a sound basis for an equitable settlement of this long outstanding issue. It should be noted with certainty that this Government is determined to resolve the issue once and for all. The issue of reform and transformation is also what influences what we do at the executive level. We continue to remain true to a commitment we gave in 2013, to continually adjust ministerial positions to most importantly, improve efficiency and to give members of our team different experiences, especially those who have served for a long time in any one area. Several team members who might be juggling schedules and responsibilities need an opportunity to spend more time back on the ground, serving the very people who put them in office in the first place. There is a growing need to provide more support in the Ministry of Agriculture, Lands, Forestry, Fisheries and the Environment, which have additional challenges at this time. We are bringing in personnel with different skill sets to take on very specific areas within that ministry. Within the Prime Minister’s extensive ministry, there is also a need for increased expertise, given the series of expanded services we are planning to undertake and manage in the coming period, such as paying executive attention to cost-savings and waste management within government, as well as a more vigorous focus on implementation, given the variety of projects that are either on stream or in train. I have always said as well that as a parliamentarian, one has to be given a wide range of opportunities to serve in different areas to develop scope and capabilities. I assure the Nation that the changes we are embarking on will serve to increase service delivery in government at no additional cost to the taxpayers of this country. As we are three and a half years into this term, we also believe that it is crucial that we position ourselves and the Party for both succession and success. Some of our colleagues will be relieved of various other duties to help direct constituency organizational matters. In regards to MPs, each is first and foremost a parliamentary representative, who is called on from time to time to serve in the executive. The challenge has always been to find the right balance to satisfy both areas. Therefore, as with previous adjustments, changes must occur with a view to enhancing both the work of the government and the constituencies which MPs represent, all at the same time. It is in this context and against this backdrop, that I will inform the Governor General of the following changes in ministerial portfolios that will take place effective July 1st. Firstly, there will be a new senator. Mrs. Pamela Moses, a former principal of the St. Andrew’s Anglican Secondary School, who has given years of community service to the people of St. Patrick’s and surrounding areas, will now enter the Upper Chamber of the House of Parliament, as a replacement to Senator Sheldon Scott. Senator Scott has given three and a half years of dynamic service and has proven himself competent in the area of articulating Government’s policy positions. He will now be engaged full time with, and paid by the New National Party in the areas of public relations and organization. Incoming Senator Moses will also be appointed the Parliamentary Secretary with specific responsibility for Youth and Religious Affairs, in the Ministry of Sports, Youth and Religious Affairs, which will now be headed by Honourable Roland Bhola. Minister Bhola, one of the most experienced members of our team, is taking over the Sports Ministry from the Minister who has served in that capacity for a number of years. The new Minister for Agriculture, Lands, Forestry, Fisheries and the Environment will be Honourable Yolande Bain–Horsford. In the period in which she served as Tourism Minister, she made a great impact. Therefore, we are confident that she will bring that same record of success to help confront the varying challenges facing the Agriculture sector. In this new thrust, she will be supported by another Minister and a Minister of State. Honourable Alvin Dabreo will continue as a Minister within that Ministry, with specific responsibility for Forestry and Fisheries. Honourable Simon Stiell will be the Minister of State with specific responsibility for the Environment. Senator Stiell will also continue as Minister of State in the Ministry of Education and Human Resource, with specific responsibility for Human Resource. The Minister of Education, Honourable Anthony Boatswain, remains unchanged. Also, as of July 1st, the present Minister of Youth, Sports and Religious Affairs, Honourable Emmalin Pierre, who has long served in that area with energy and compassion, will be one of three Ministers in the Prime Minister’s Ministry. She will bring that dynamism to her new area as the Minister of Implementation. As we continue with our commitment to deliver, this is a crucial area in helping to fulfil our promises. Two other critical areas for economic growth are the Citizenship by Investment Programme and the Waste Management programme. Honourable Alexandra Otway–Noel, who, over the last few months, has ably served those departments, will now be the Minister in the Prime Minister’s Ministry with special responsibility for Waste Management and the Promotion of the Citizenship by Investment Programme. Also, under my Ministry will be Minister of State, Senator the Honourable Winston Garraway, who will be responsible for Disaster Management and Information. Honourable Nickolas Steele, someone with proven business acumen, who is now the Minister for Health and Social Security will have additional responsibility for International Business. Honourable Oliver Joseph, the Minister for Economic Development, Trade, and Planning, who has had an exemplary public service career, inclusive of labour relations experience and trade unionism, will now have the Ministry of Labour added to his portfolio. 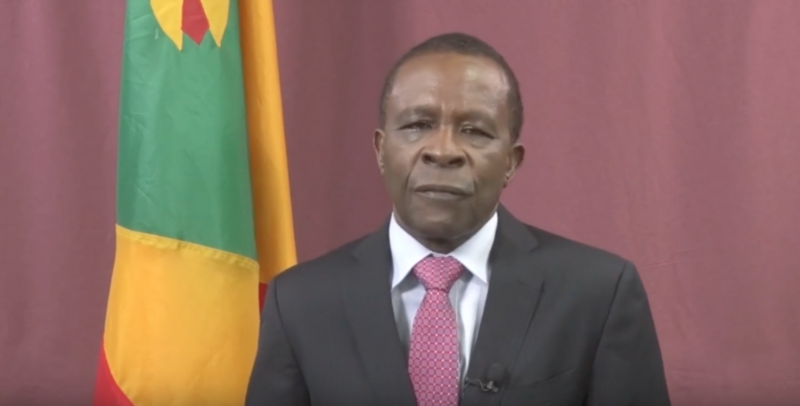 Our stalwart Deputy, Honourable Elvin Nimrod, the Minister for Carriacou and Petite Martinique Affairs and Legal Affairs will also now be the Minister for Foreign Affairs. Honourable Clarice Modeste, now Minister for Foreign Affairs, is being asked to steer the ship as the new Minister for Tourism, Civil Aviation, Culture and Cooperatives, with specific responsibility for Tourism and Civil Aviation. Senator Brenda Hood will continue as the Minister in that Ministry, with responsibility for Culture and Cooperatives. With this reconfigured team, we look forward expectantly to this final period of this term, as we build on the achievements of the first three and a half years, and as we position our economy for a prolonged period of growth and opportunity. I have been blessed to have at my disposal the best political team now available in this country — and together we shall continue in the cause of empowerment. We are grateful each day that we have the opportunity to serve you, never taking anything for granted. And through the grace of this Almighty God we all serve, we are confident that we will continue to embark on policies that will uplift all of His people.